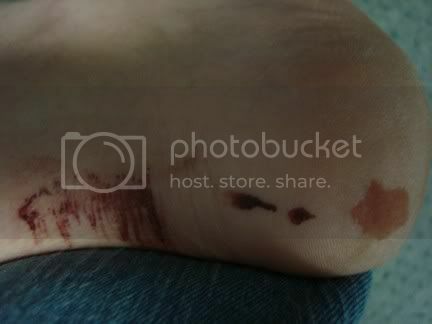 I've been told that the photo of my bloody heel is sickening. So... click the link if you want to see it. I guess it is kind of gross. I'm just used to bloody skater feet. CLICK HERE FOR THE GORE! For the time being I'm practicing. Because really, who the hell am I kidding? I'll end up skating this season. And I'll swear up and down it's my last, and that may be true, or it may not. I am however, vowing not to kill myself this year. I'm not going to Kalamazoo next month. Much as I want to, I would kill myself trying to schedule it, we'll be training two employees (hopefully) and really, they don't need me for that bout. So I will stay home. And it'll break my heart, and I'll be bummed out all weekend, but I just can't kill myself trying to take a weekend off work to get there. I am however, going to try and get some new wrap and padding for my feet. I heard that squishy, rubbery pink wrap is pretty good. Can't think of what it's called though. Think of it like a gymnastics mat or yoga mat in thinner strips. You better be back...or this ole Derby fanatics heart will implode and it'll be a real bother and a nasty mess and well..you dont wanna be responsible for al that do ya??!! Course ya dont.